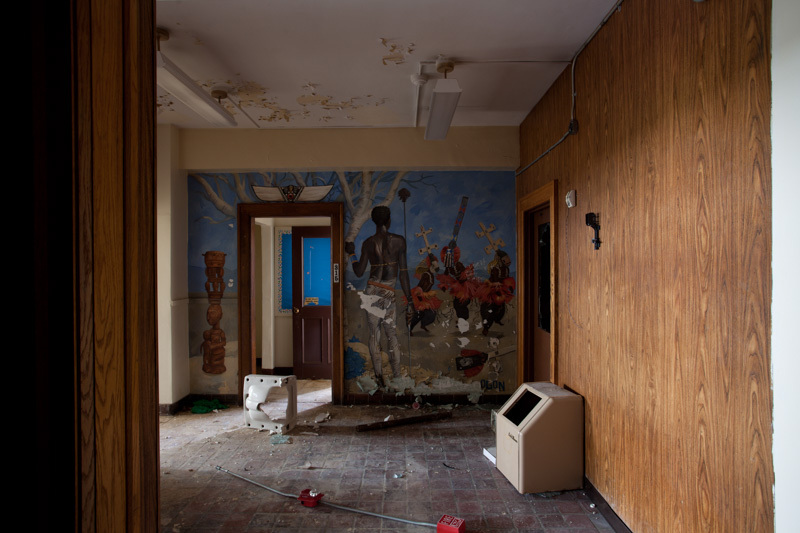 In many ways, the histories of Detroit and Highland Park – a separate city located within the borders of Detroit –are very similar. Both cities experienced tremendous growth as a result of the automobile industry, and built up their city services to meet demand. Both cities lost population after the auto industry left. And today, both cities are struggling with how to provide the same city services to fewer people with less tax revenue. 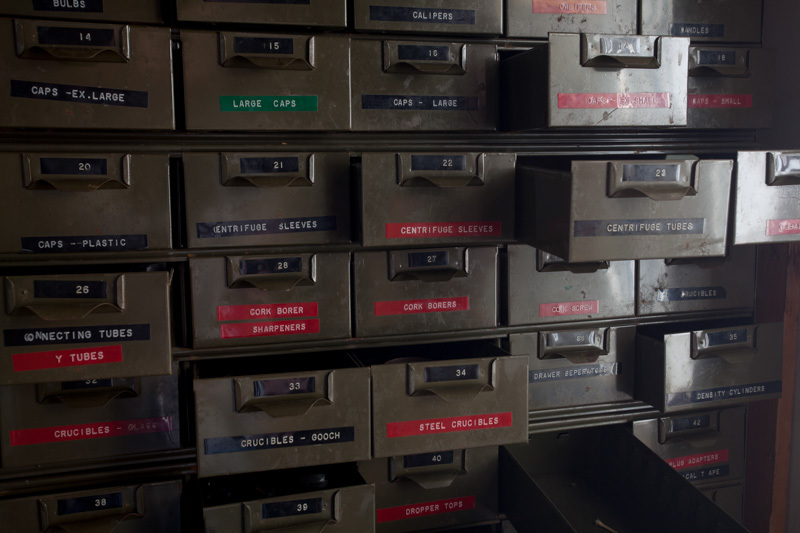 Budget cuts have led to the closure of most of Highland Park’s fire stations, libraries, and schools. A three-block stretch of Highland Street running west from Woodward Avenue was one the civic center of the city. Along Highland and nearby streets were five schools, three churches, two hospitals, and the main library, mixed in with ornate high-rise apartment buildings. In this densely populated neighborhood one could be born, baptized, attend nursery school, elementary school, high school, and college, all without going more than three blocks in any direction. 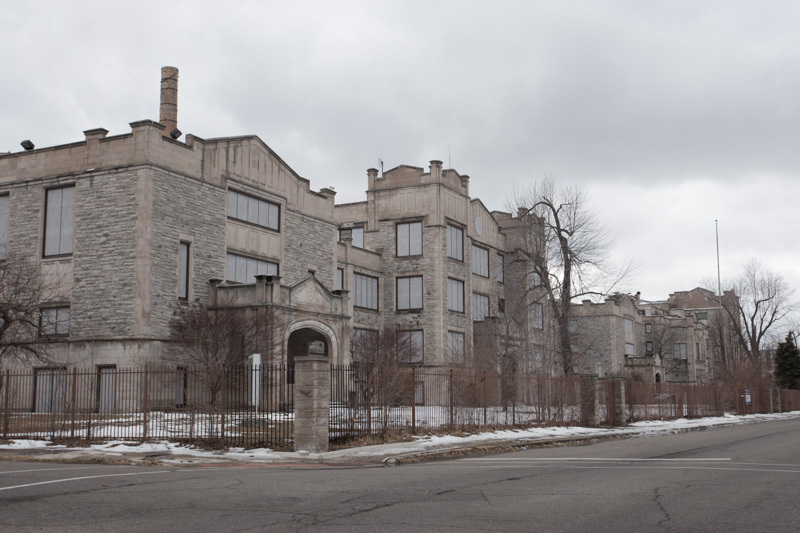 Right at the center of the neighborhood is the old Highland Park High School and Junior College, a block-long slab of quarry-faced limestone that played an important role in the development of Highland Park from an obscure village into an industrial boomtown. 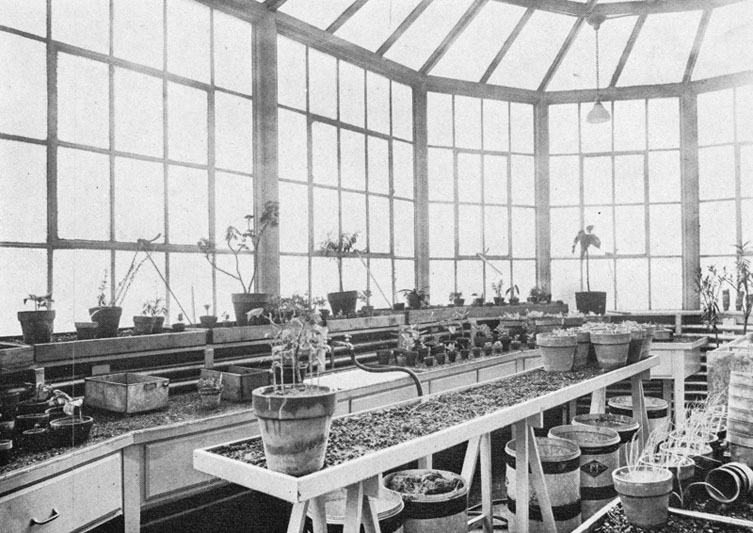 In 1900, Highland Park was just a small village north of Detroit, population 427. Through the early 1900’s, the city grew as Detroit developed north along Woodward Avenue, spurring residential development. In 1907, Henry Ford began to move his automobile production from the Piquette Avenue Plant in Detroit to a new, much larger factory located in Highland Park. 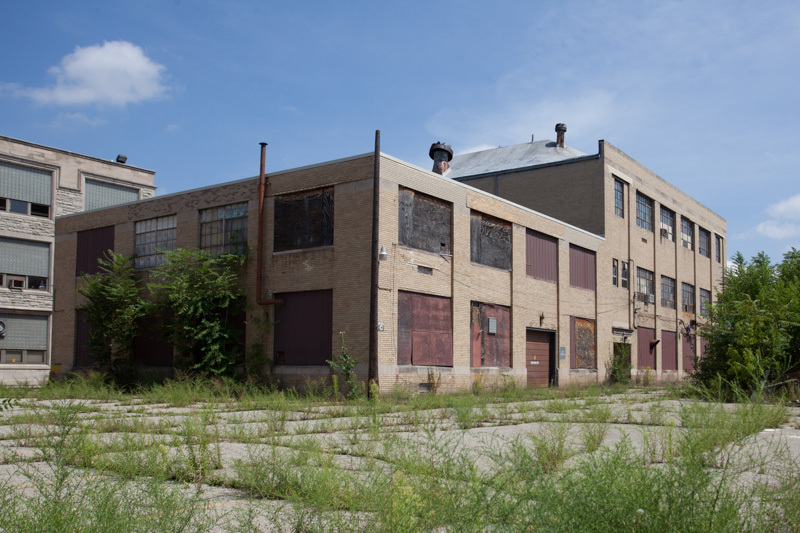 The factory opened in 1909; a year later the population of Highland Park had risen to 4,120 as workers quickly built up neighborhoods around the Ford plant. Like other early school districts, Highland Park Schools taught from Kindergarten to the 8th grade level, at which point young adults were expected to join the workforce. 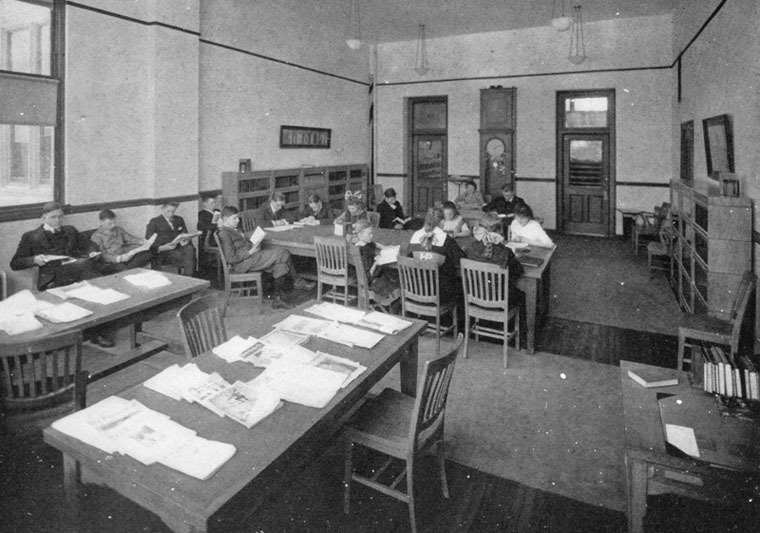 Starting in 1911, high school courses were introduced, with 42 students enrolled in 9th and 10th grade levels at Stevens Elementary, then moved to the new Ferris School when it opened in November. The next year 11th and 12th grades were introduced. 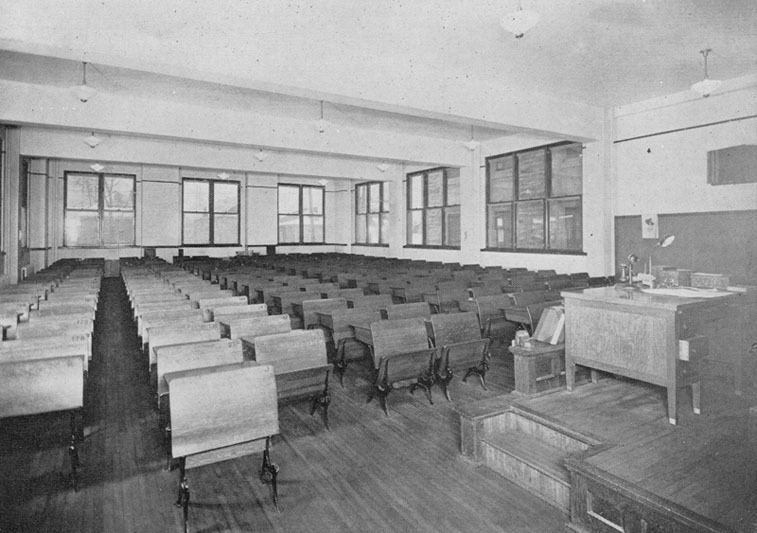 Demand for higher education was enough that by 1912, plans were underway to build a dedicated high school building. 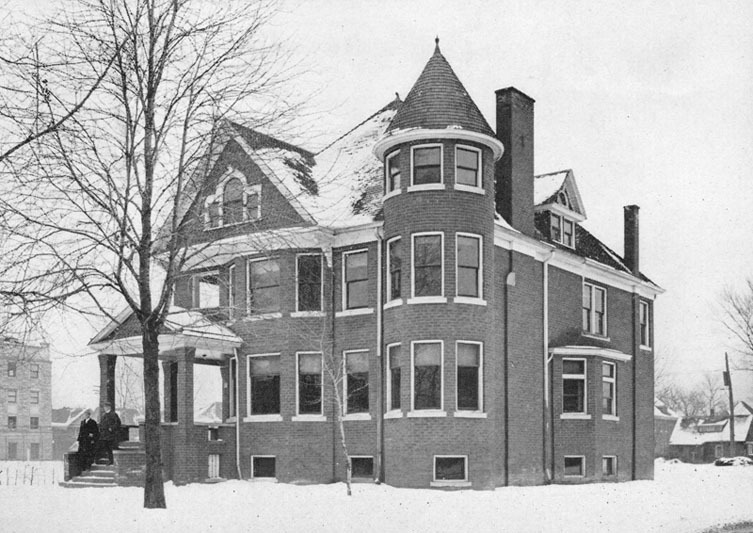 Initially the board of education wanted to build the new high school east of Woodward Avenue, at Farrand and John R Streets, but instead settled a large rectangular parcel of land along Glendale Street between 2nd and 3rd Avenues. 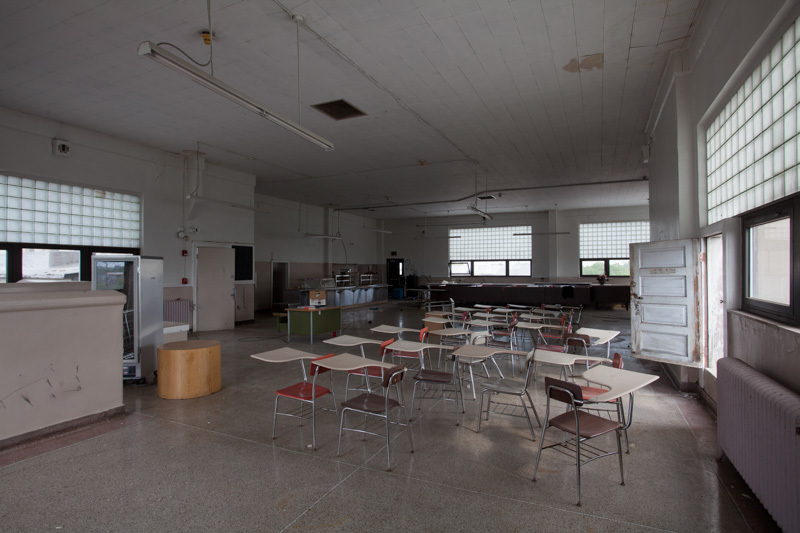 Though the high school would take up only a small part of the land, school officials wanted additional space to expand the school if needed. 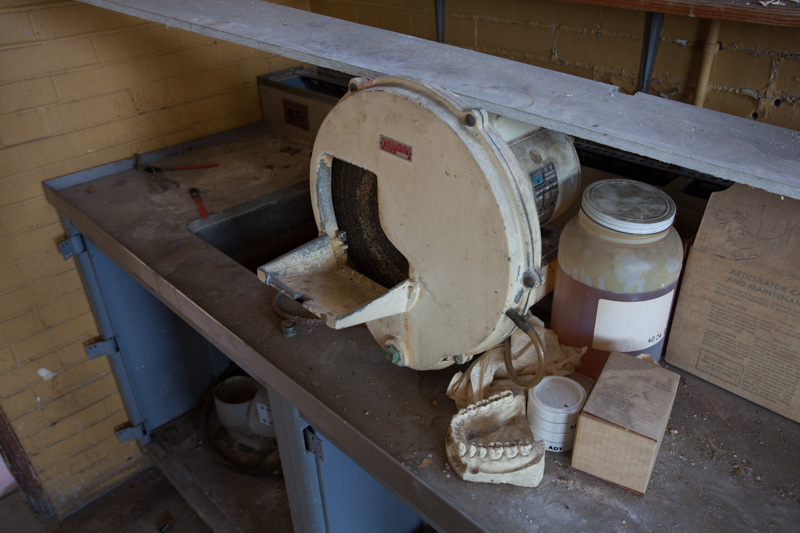 Excavation at the site began as the first high school class of 14 students graduated from Ferris School in 1913. 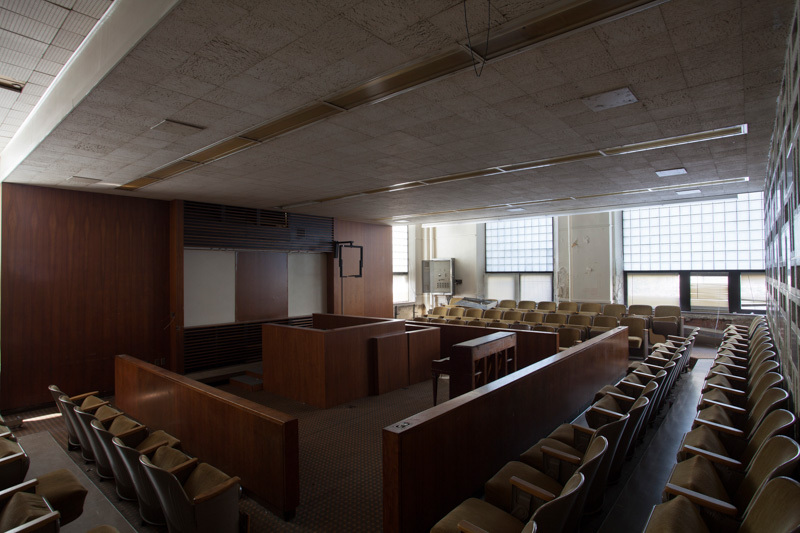 In 1914, a contract for construction of the new building designed by Wells D. Butterfield was awarded for $460,000. 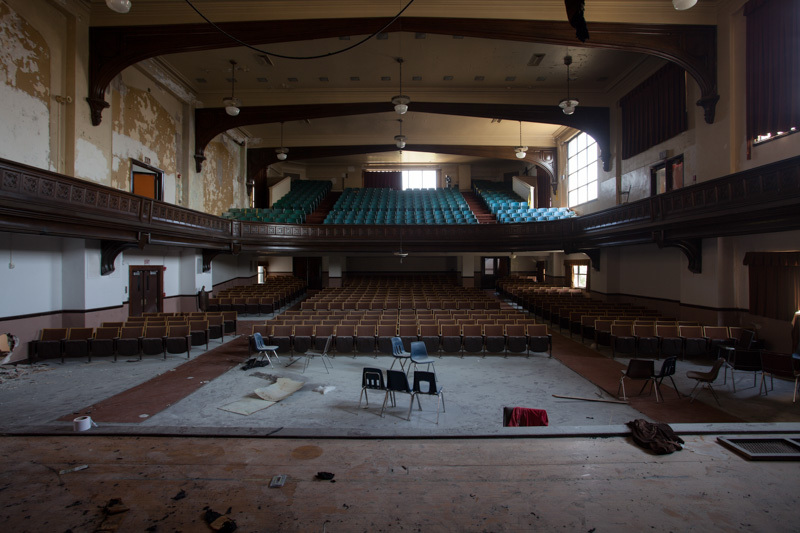 It could comfortably seat 1,000 students, though it was believed that it would be quite a few years before the school reached capacity. 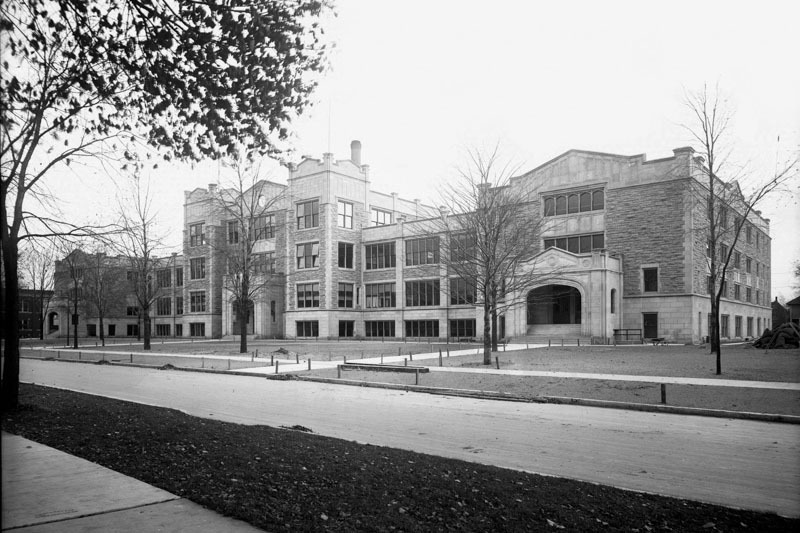 The first unit of Highland Park High School was of English type architecture, laid out with a central mass three stories tall, with two end wings linked by classrooms. 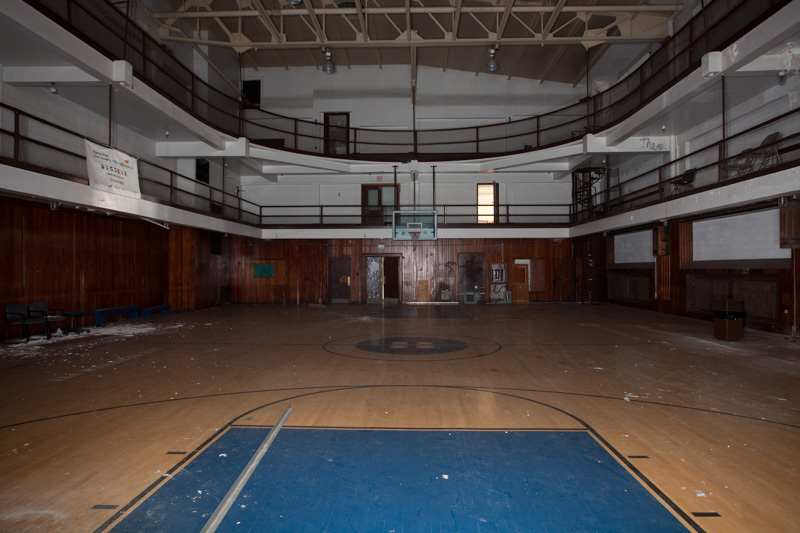 The east wing had a 1,100-seat auditorium, and the west wing featured a three-story gymnasium and basement swimming pool. In the center were school offices, a library, and recitation rooms. The exterior was done up in quarry-faced gray limestone, with mouldings and detail work of dressed Bedford stone. 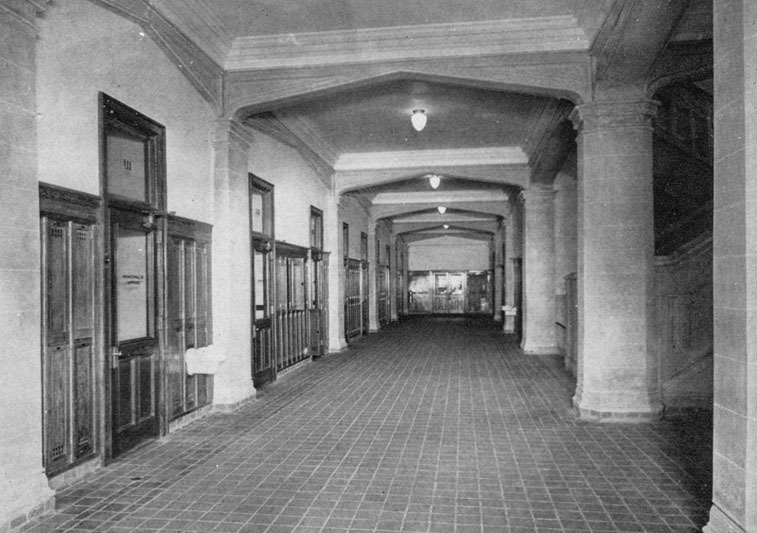 Inside the school were long hallways of Caen stone and ornamental carved oak. 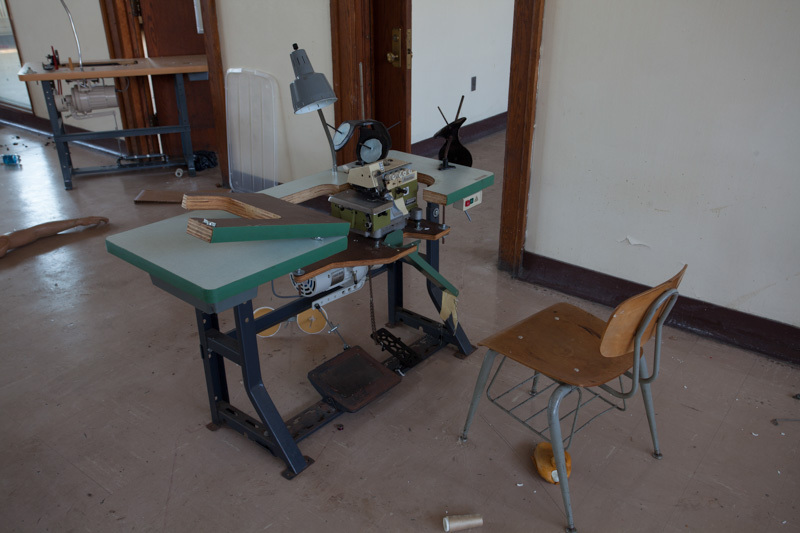 Dedicated classrooms included sewing, carpentry, machine tooling, botany, chemistry, and drawing. The cornerstone was laid down in October of 1914. 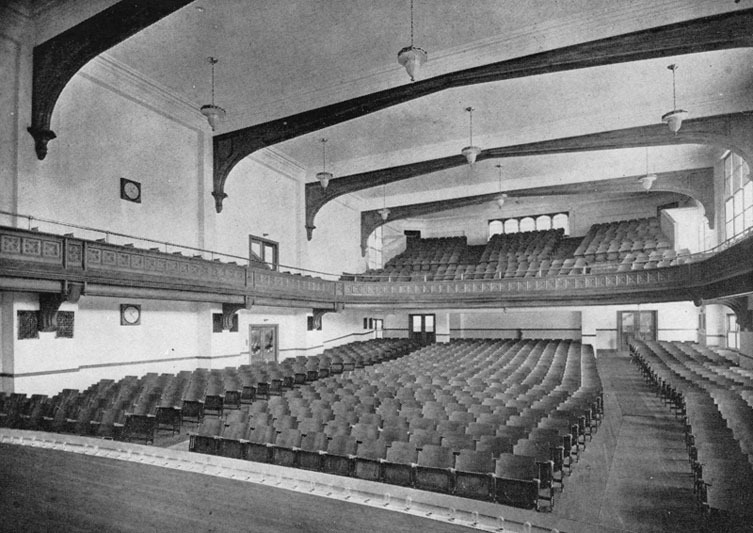 Construction on the high school had progressed far enough that by June of 1915, the auditorium was used for graduation as work on the rest of the building continued. 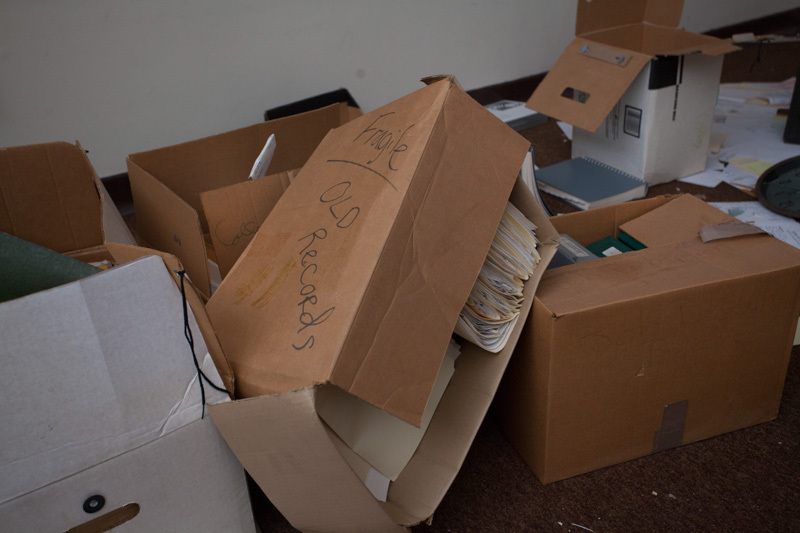 The new building was scheduled to formally open in September, but even before then school administrators were facing an unanticipated problem: overcrowding. Between 1910 and 1916, the population of Highland Park grew from 4,100 to 28,000. By 1920 there would be 46,500 residents, a staggering 1,000% increase in population over just 10 years. 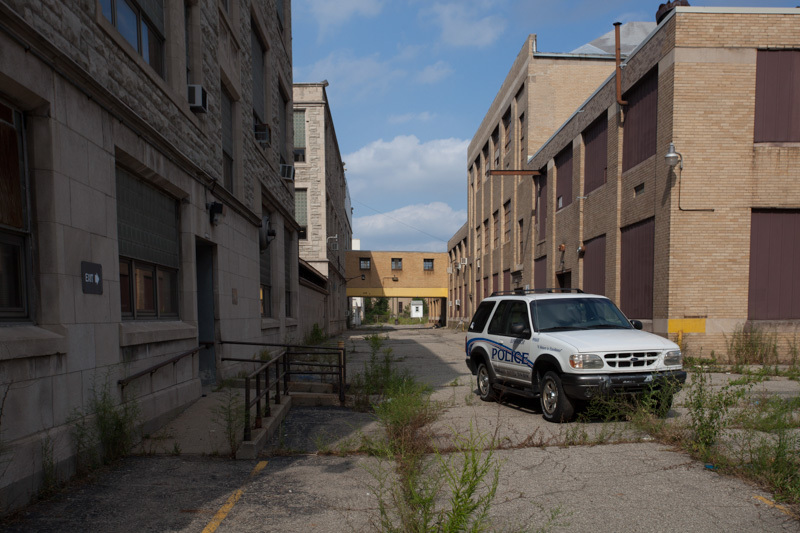 Workers from across the globe were drawn to Detroit and Highland Park in particular, by the Ford factory and its promise of a $5 a day wage. The assembly line had revolutionized the way that cars were made, and in doing so, made Highland Park the center of the automotive revolution. 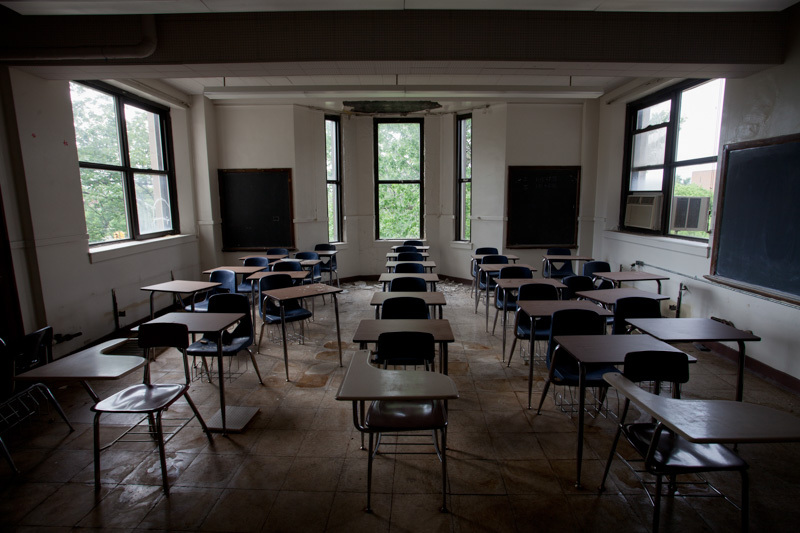 The school board found itself with hundreds of new students every year, requiring hasty additions to existing school buildings, and the construction of new schools in neighborhoods that were springing up around town. By the time Highland Park High School opened in September of 1915, enrollment far exceeded expectations, with 850 students signing up. 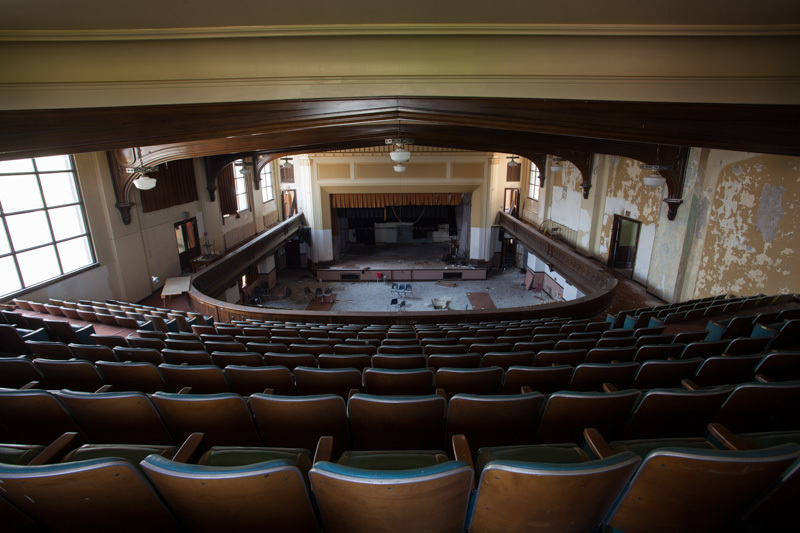 In 1916, just a year after it opened, that number grew to over 1,000 high school students, filling the school to capacity. 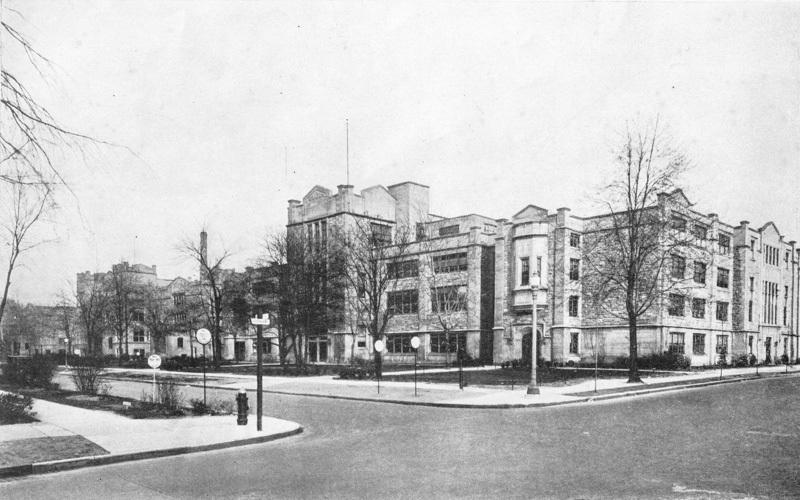 Plans for a second unit of the high school for 1,500 additional students to be built next to the first were immediately drawn up, with construction beginning in 1917. Though the second unit of the high school used identical building materials and same English styling as the first, it was laid out differently. 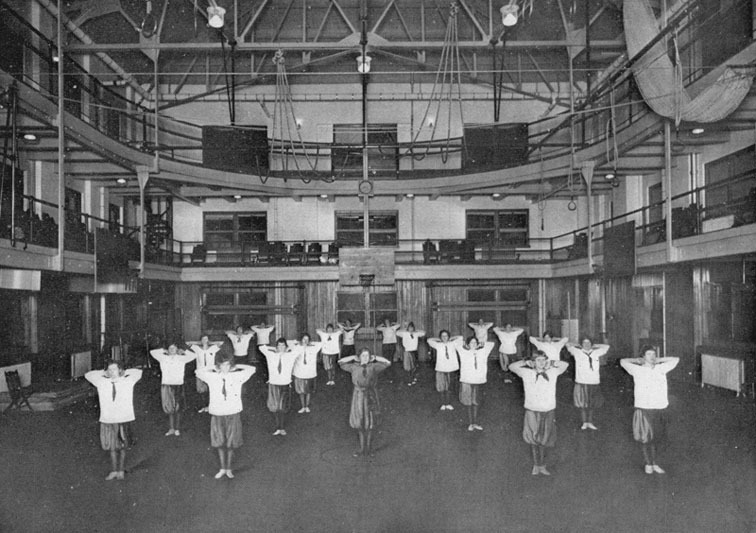 Initially the second unit was intended to be a high school for girls and a junior college, and was built with its own separate gymnasium and swimming pool. 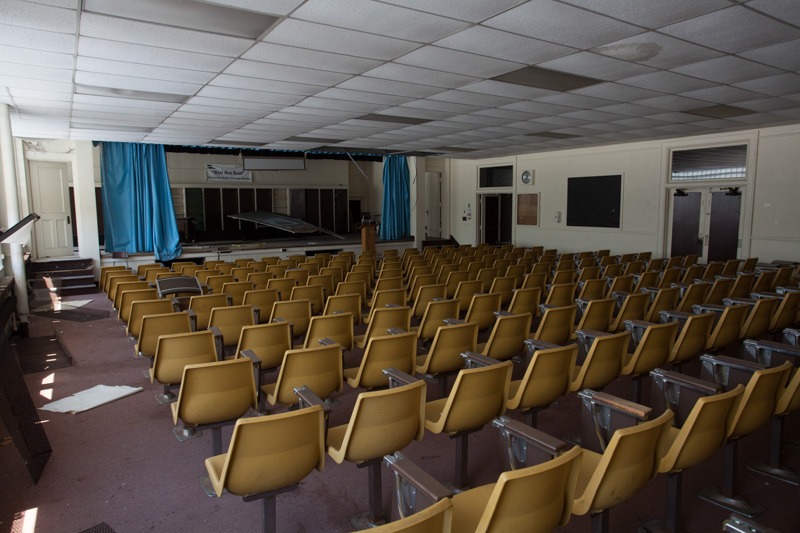 Instead of a second auditorium, a larger library and additional classrooms were set aside for a junior college program that would share the building with the girl’s high school. 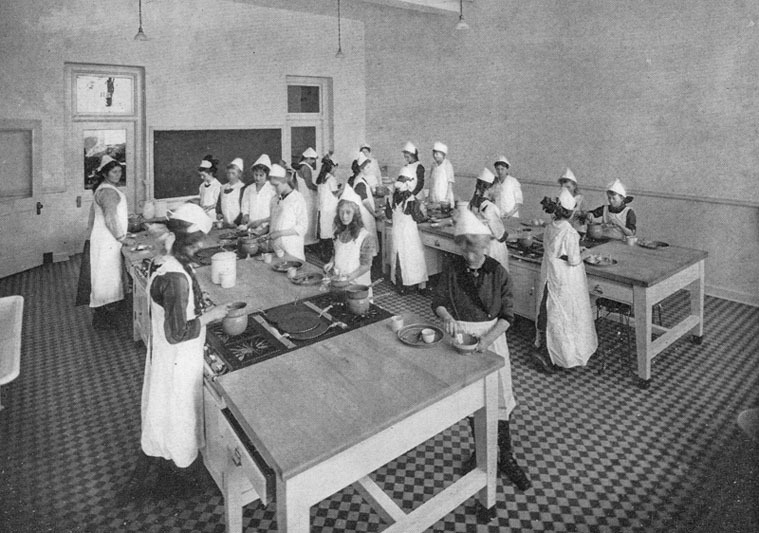 The new high school for girls opened in September of 1918, with a total enrollment of 1,525 students. Highland Park Junior College opened in 1918 as well, with 35 students. 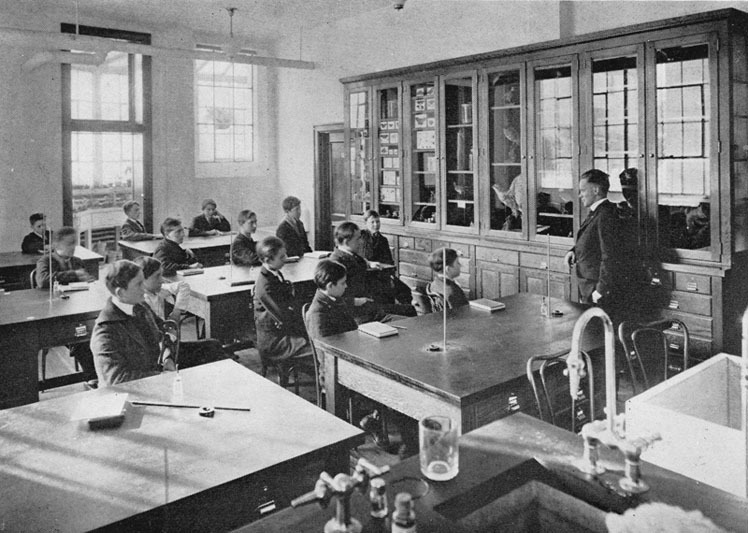 Course offerings included French, rhetoric, history, chemistry, zoology, and analytic geometry. Within a few years the two high school programs merged and became co-ed. 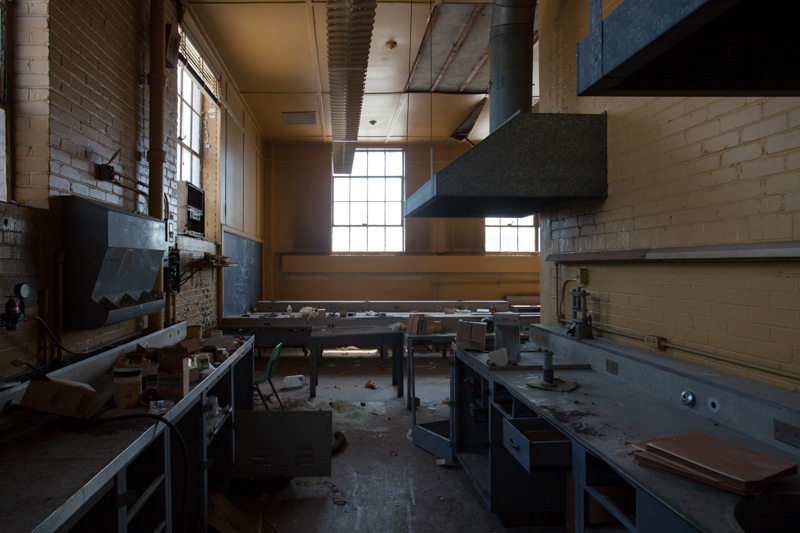 In 1927, a vocational education building including an automobile repair lab was built to south of the school, connected by an overhead walkway. 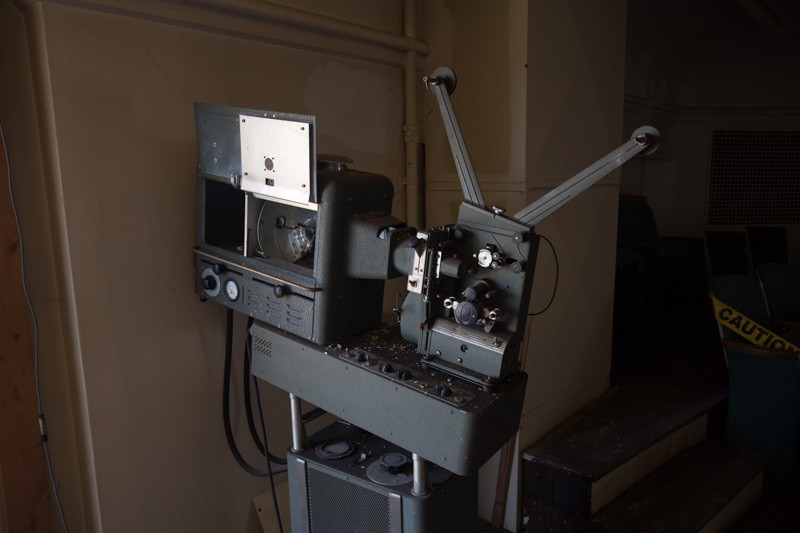 A further addition to the vocational wing was added in 1938, and the auditorium was renovated in 1939. 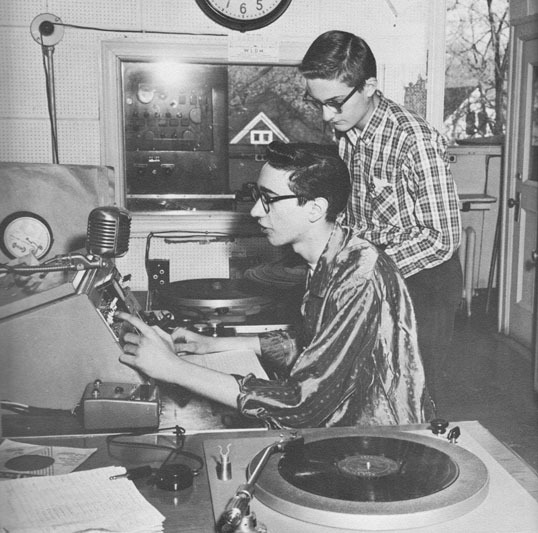 The high school thrived, with as many as 3,000 students and a host of extracurricular activities, including athletics, homemaking, and a school radio station. 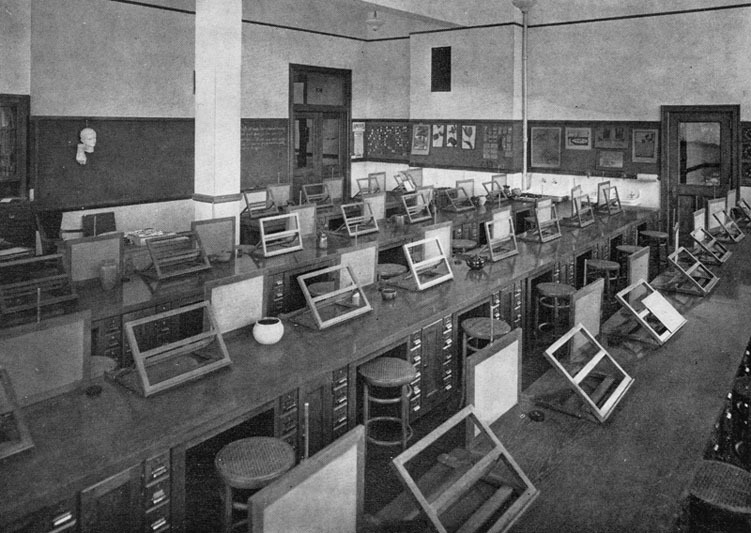 Enrollment at Highland Park Junior College steadily increased to around 300 students by the 1920’s, but slowed in the aftermath of the Great Depression. 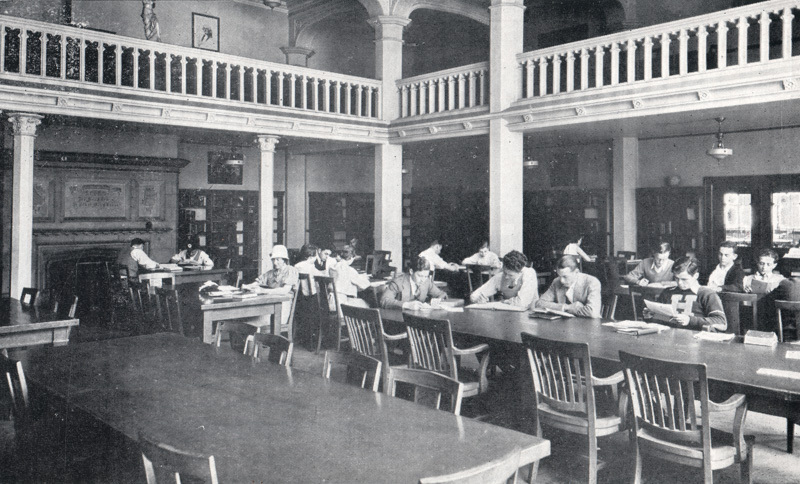 Lack of adequate space and a drop in the number of students to 159 in 1929 nearly led to the closure of college, but the residents of Highland Park voted to keep it open. 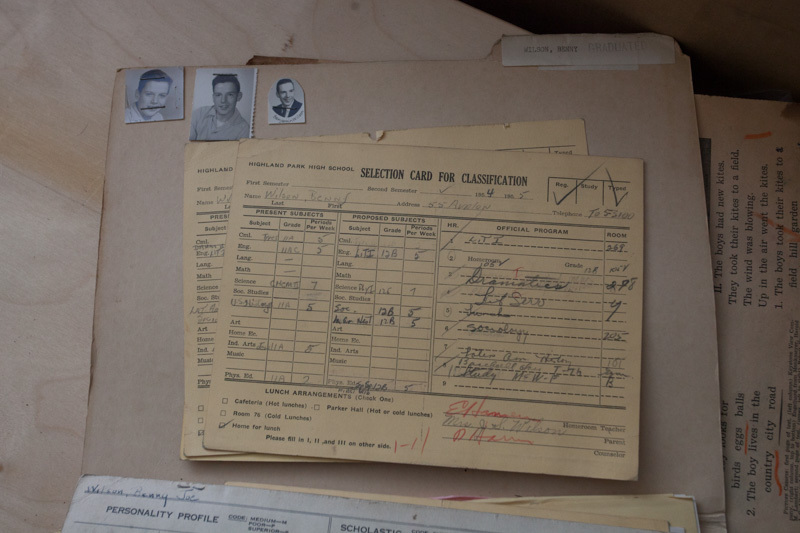 This paid off in the long run, as after the Second World War ended enrollment skyrocketed from 117 in 1943 to 1,800 in 1947 as veterans returning to Highland Park used the GI bill to pay for college education. By the 1940’s, population in Highland Park had peaked. Ford had moved auto production out of Highland Park to a new factory in the suburbs in 1927, and moved its headquarters to Dearborn in 1930. The construction of freeways made it easier for people to live outside the city, hastening an outward flight or residents to the suburbs. The racial composition of Highland Park changed as well. By 1968, over half of the 4,488 students were black, while teachers and administrators were mostly white. 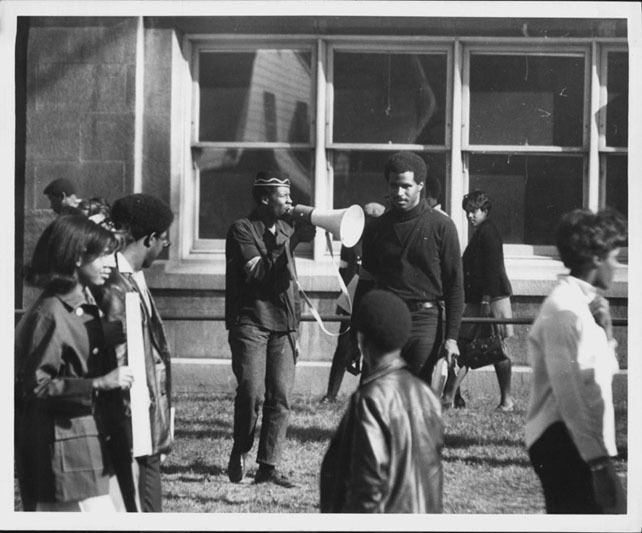 Sit-ins protesting the lack of diversity in the school administration were frequent in 1969. 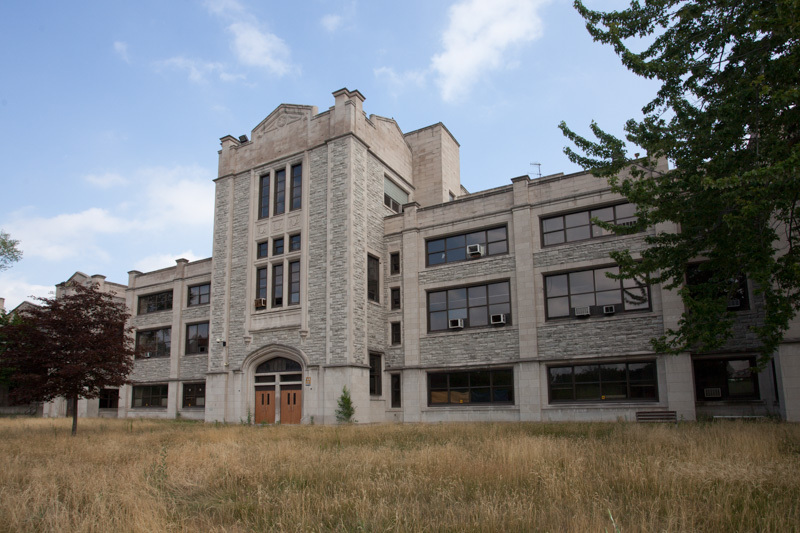 As part of a district-wide modernization program, several older schools in Highland Park were demolished and replaced with newer buildings in the 1950’s and 60’s. A nursery school was built on the south side of the campus in 1950, and an elementary school was built a block south in 1961. 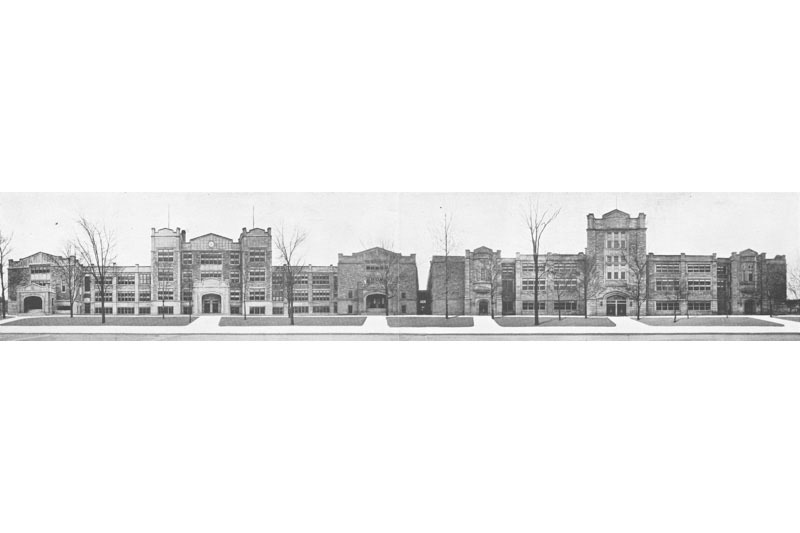 Plans for a new, modern high school to be built north on Woodward Avenue were drawn up in the early 1970’s, which would replace the existing school. 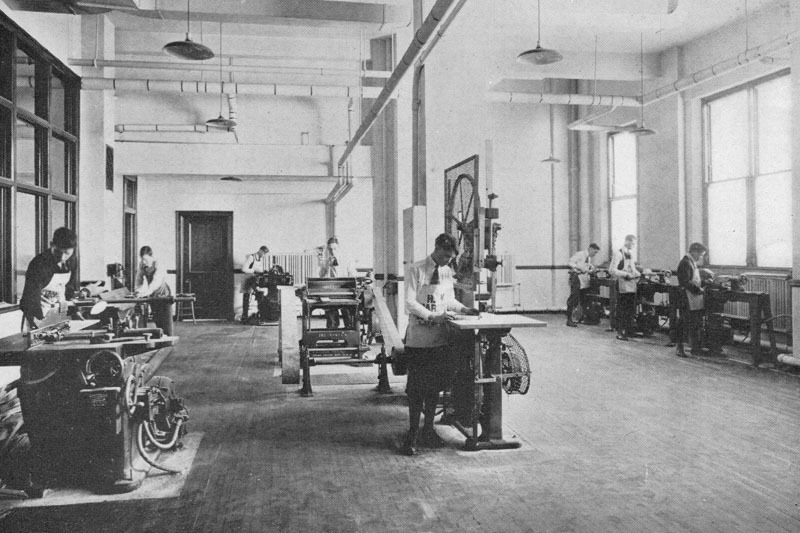 The junior college (now a community college) would take over the entire building and expand its vocational offerings. 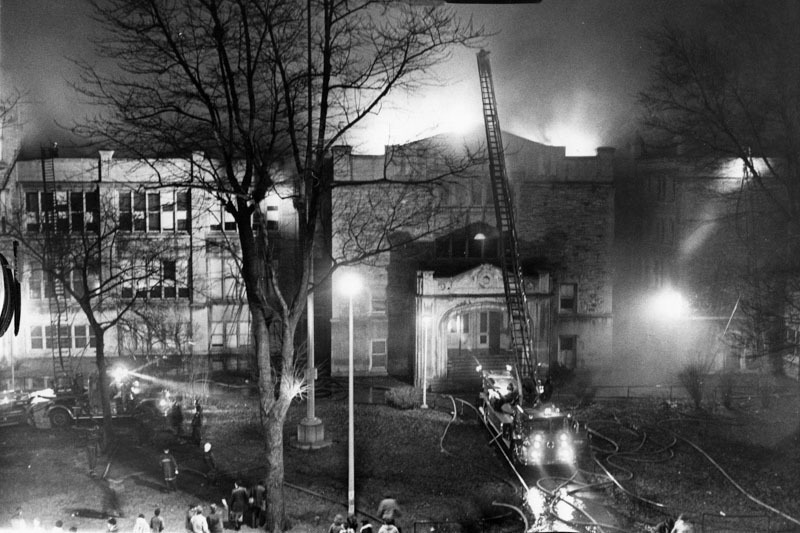 Construction on the new building was already underway when on the evening of March 18th 1975, a large fire broke out in the gymnasium of the old high school. 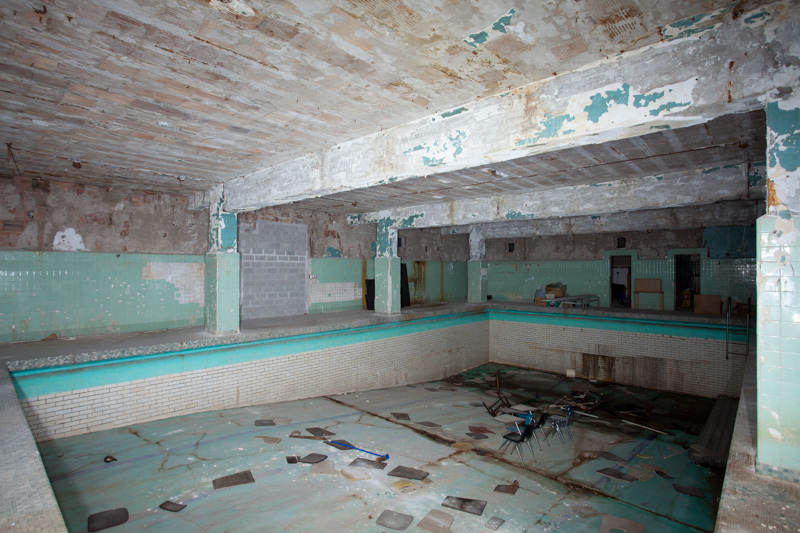 Stacks of rolled-up wrestling mats were set alight as a practical joke, but the blaze quickly spread out of control, causing the roof and floor to cave into the basement swimming pool. The fire burned for over five hours as firefighters from Highland Park, Detroit, and Hamtramck struggled to contain it to just the gymnasium. 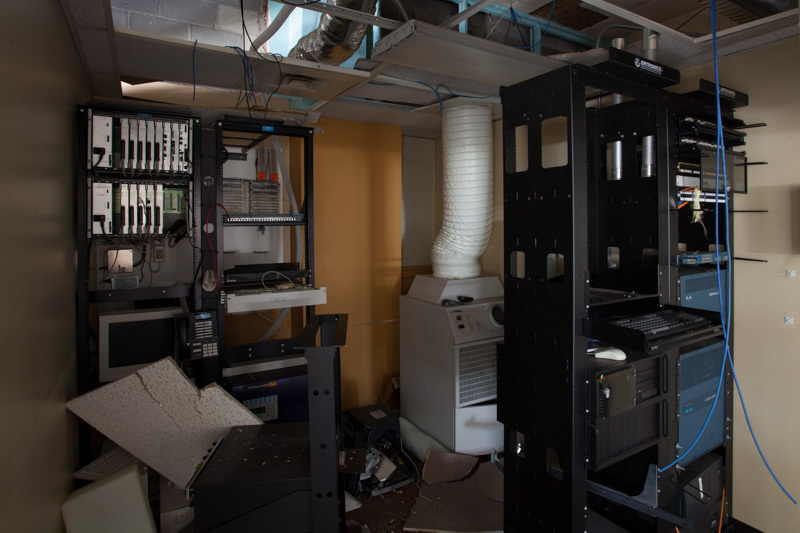 While smoke and water damage throughout the high school were repaired fairly quickly, repairing the gymnasium was estimated to cost over $600,000. 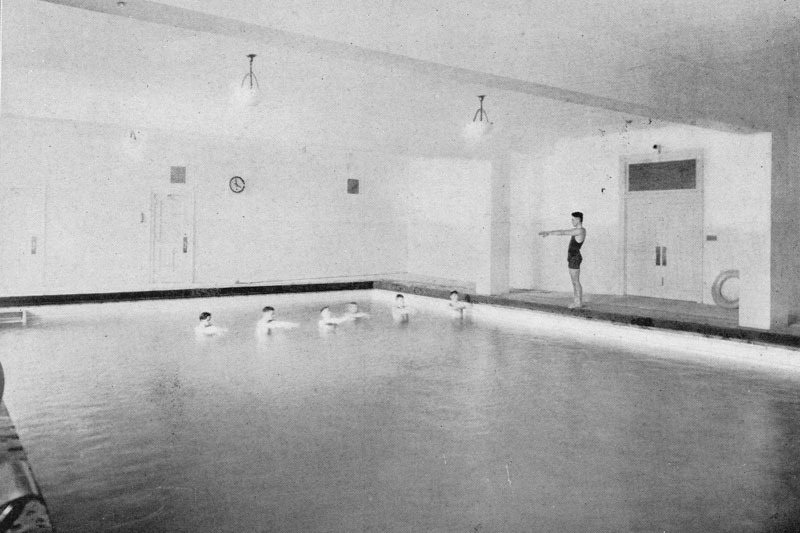 Since the high school was moving out in the near future, athletics were moved over to the community college building, which had its own pool and gymnasium. 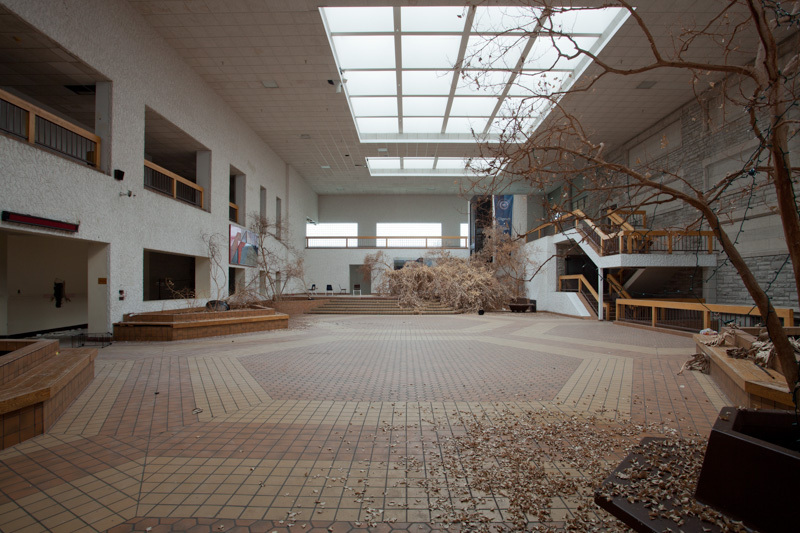 In 1977, the new Highland Park Community High School on Woodward Avenue opened, and the community college took over the Glendale campus. 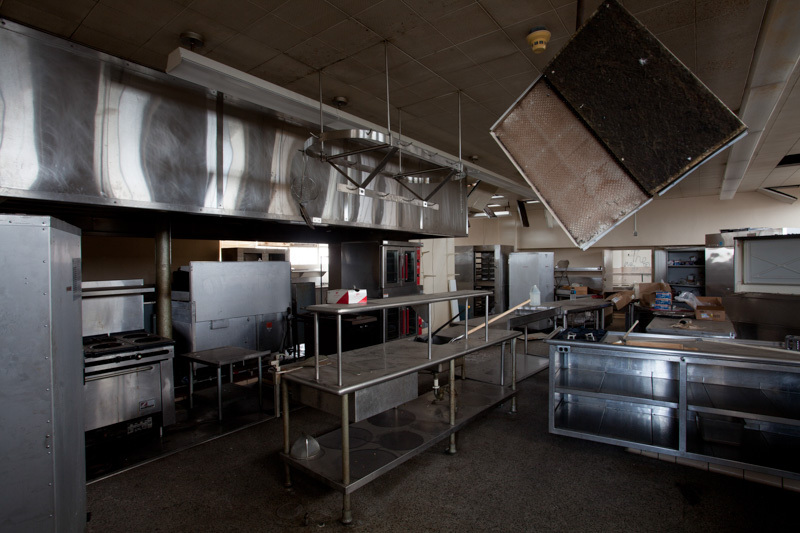 A temporary roof was built over the shell of the burned-out gymnasium, as administrators struggled with what to do next. 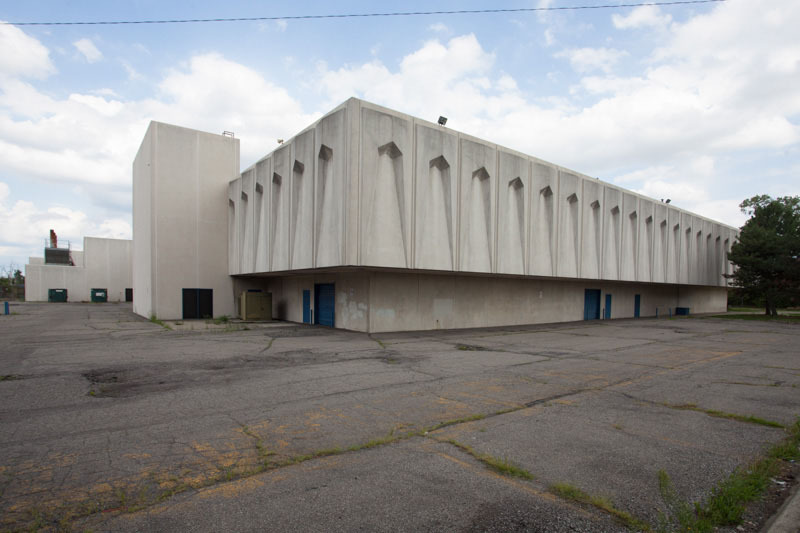 Not wishing to demolish the handsome limestone façade of the gym, the wing sat empty until 1983, when the community college approached Bloomfield Hills landscape architect James Scott about reusing the space. 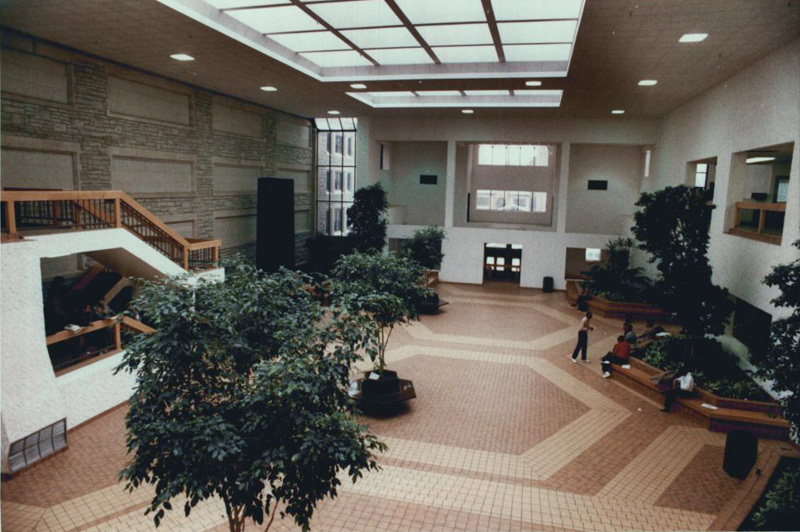 Scott envisioned turning the empty hall into a “multi-purpose concourse” and performing arts space, linking the two units together. Within a few days his ideas went from sketches to planning, and work began a short time later. 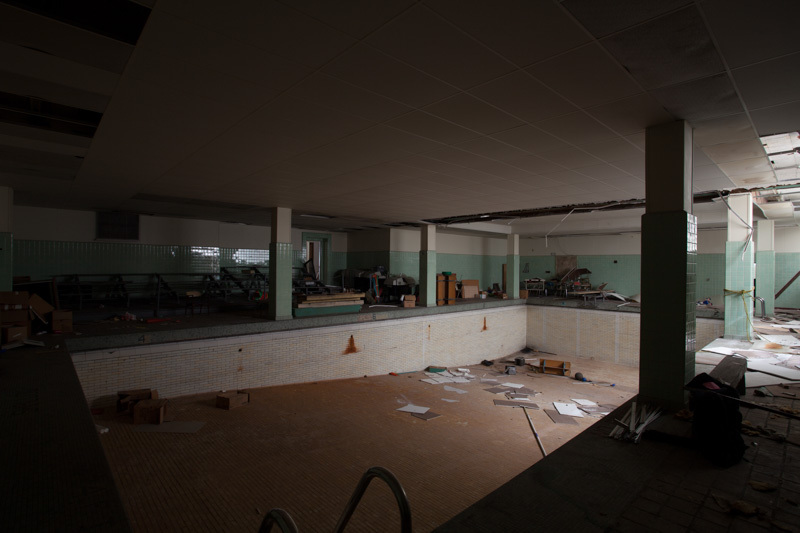 The swimming pool, into which burning debris from above had been dumped, was covered by a new floor and sealed off. The open area above was a mix of the old and new, retaining the limestone wall of the adjacent gym, but incorporating modern styling throughout. Hexagons were the dominant theme, with planters turning the concourse into a green space. Work on the renovation concluded in 1985. 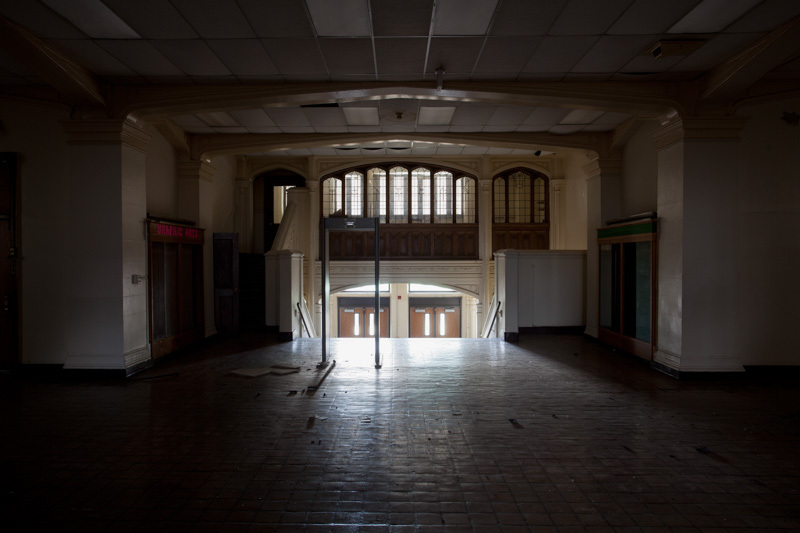 In the years after the space was used for concerts, special events, and art galleries. In February of 1995, Governor Engler announced that all funding for the college would be stripped from the budget due to chronic financial and academic problems, stating, “Though the college has a long and distinguished tradition, it has become apparent that it is no longer an economically viable institution." 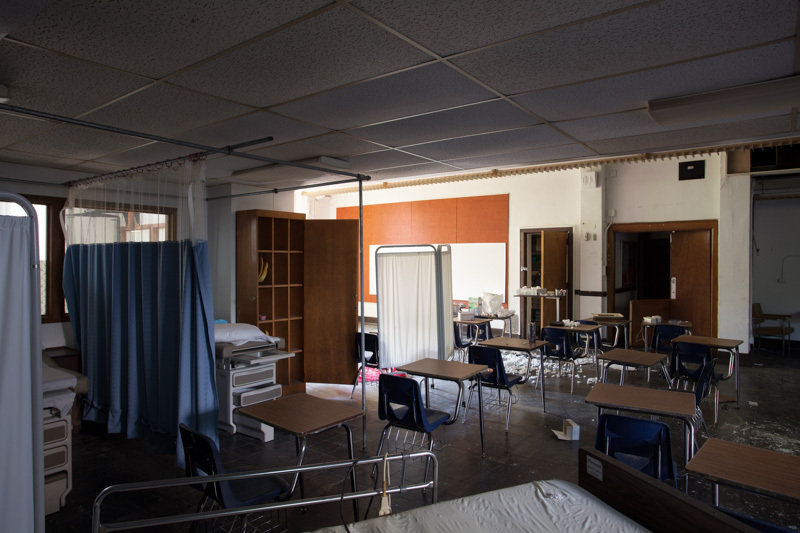 Local representatives fought hard to keep the school open, arguing that it was making progress in fixing its financial situation and that the loss of the school would be devastating to Highland Park’s troubled economy. 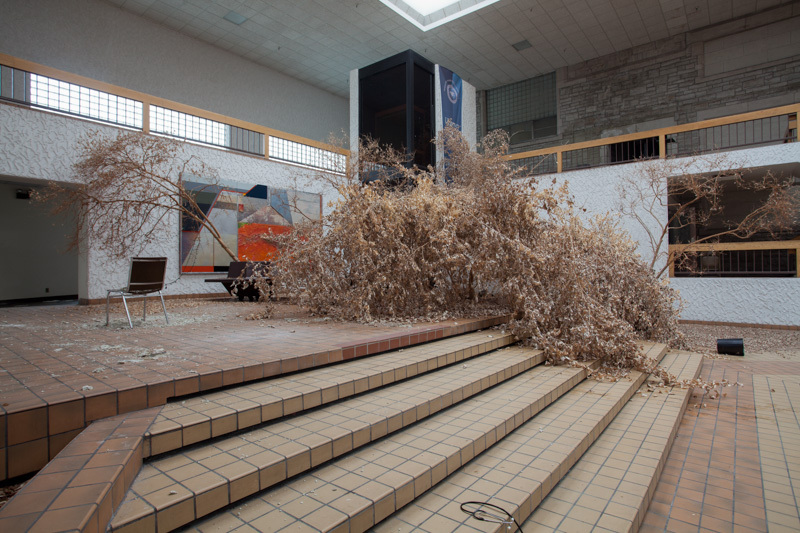 By December of 1995 the college had run out of money, and closed down. The immediate impact of the closing of Highland Park Community College was that students were stranded in mid-study, some just a semester away from graduation. Though other nearby colleges tried to accommodate students, many never finished their studies, and walked away from secondary education. 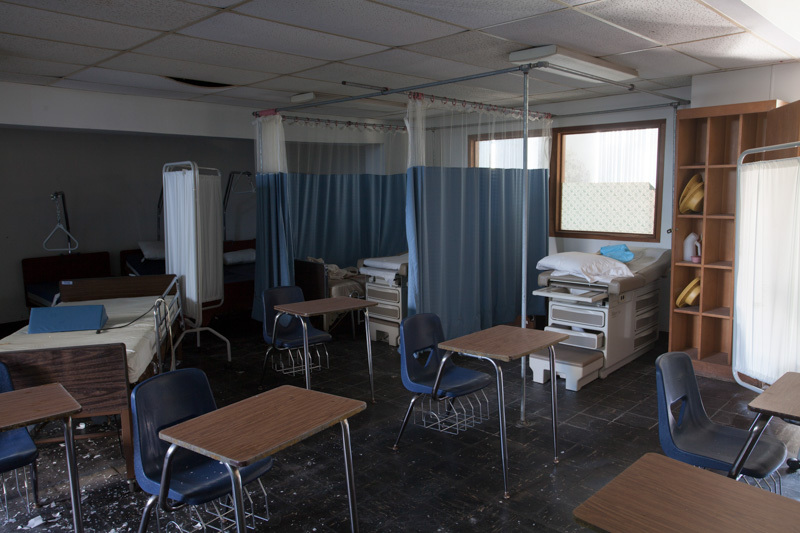 While elected officials fought to get funding restored, the school reopened as the Highland Park Career Academy, offering an alternative high school program and vocational training for students and young adults in the fields of nursing, dental hygiene, and auto repair. 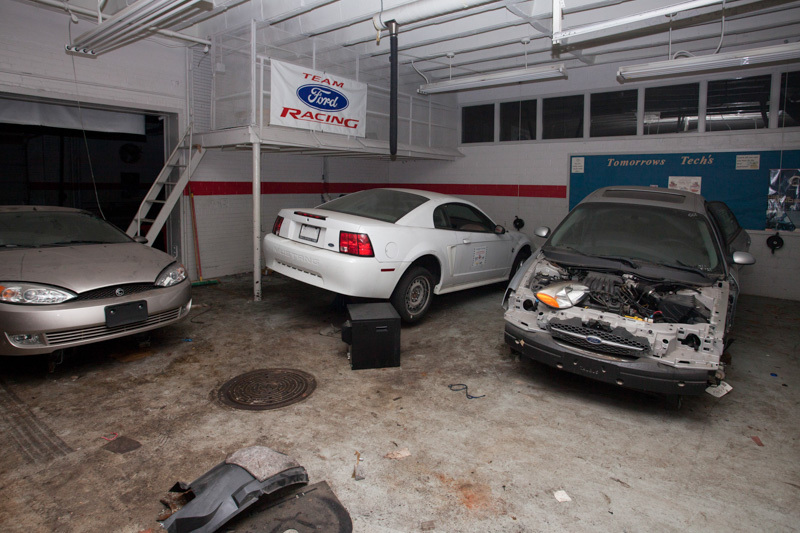 In 2001, the Ford Motor Company opened an automotive training center in the vocational education building, complete with demonstration cars. Highland Park City Schools steadily lost students through the 2000’s, with K-12 enrollment falling to 2,700 by 2008 as students were lured away to other nearby school districts. 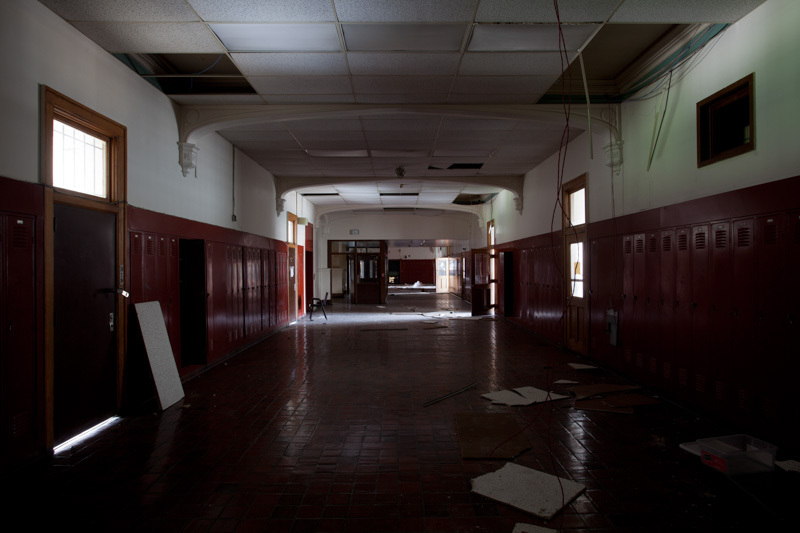 As schools were funded by the state on a per pupil basis, this led to a major revenue shortfall for Highland Park. On January 23rd, 2009 the school board shut down the career academy with no official notification to parents, laying off 36 teachers to close the budget gap. Students were again left in the lurch with the cancellation of their programs, with few options for continuing their studies elsewhere. and leaving students stranded in mid-study. Only seniors were allowed to stay at the school until the end of the school year, with the remaining students to attend night school at Highland Park Community High School. 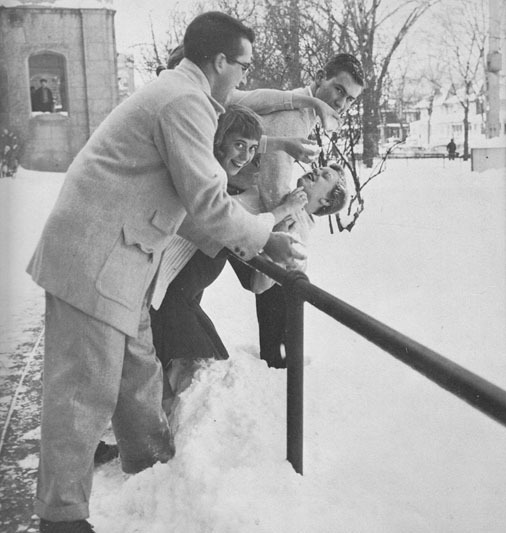 However, the first scheduled night of classes was canceled without explanation. 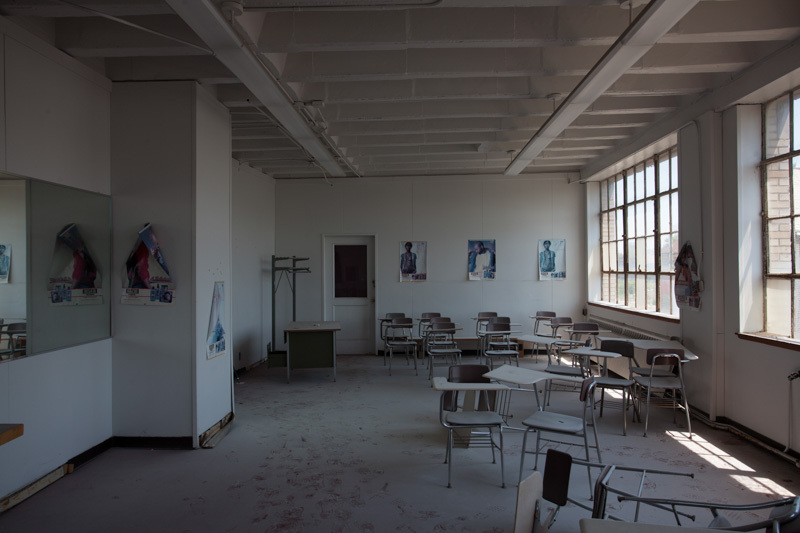 Most students dropped out, and the building closed for good in the summer of 2009. 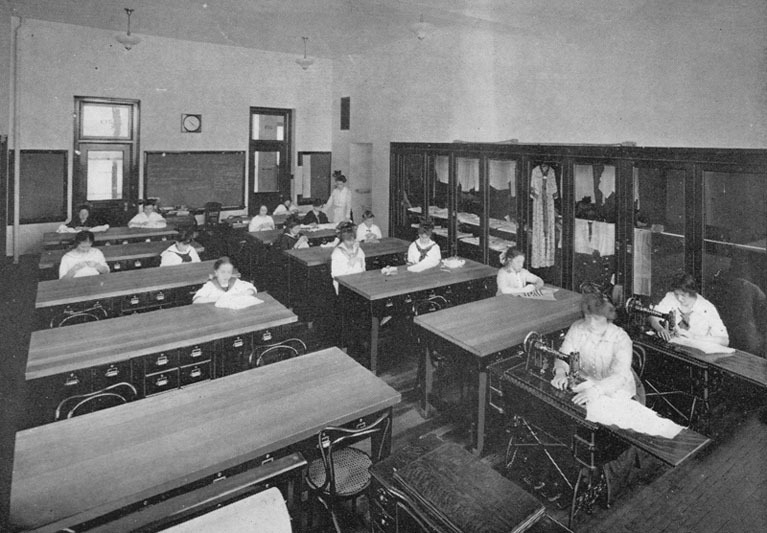 For over 90 years, the old high school and college had been the center of Highland Park’s education system. 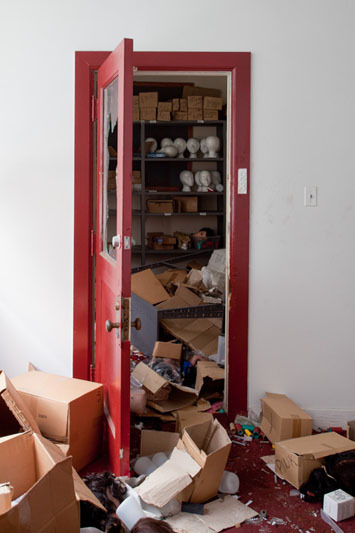 By the time the school closed, the neighborhood and city around it had changed considerably. Ferris School and the hospitals closed in the 1990’s, along with the main library in 2002. The nursery school closed permanently in 2005. 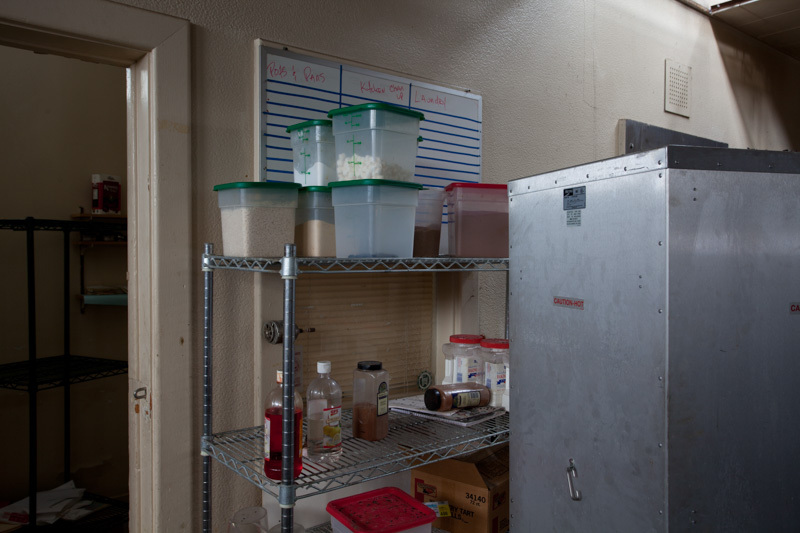 Most of the apartment buildings along Glendale and Highland had been vacated years ago, leaving large gaps in the fabric of the neighborhood. 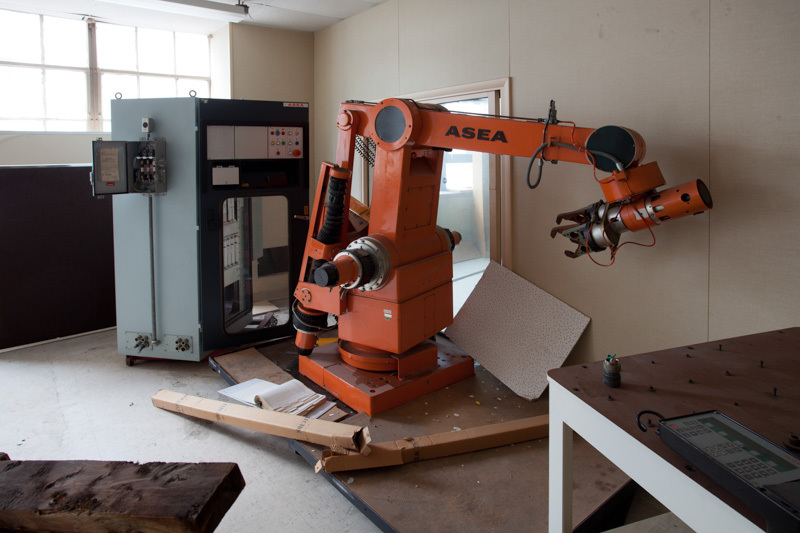 In the end, the closing of the career academy wound up costing the school district a large amount of funding, as students dropped out or left for other school districts. 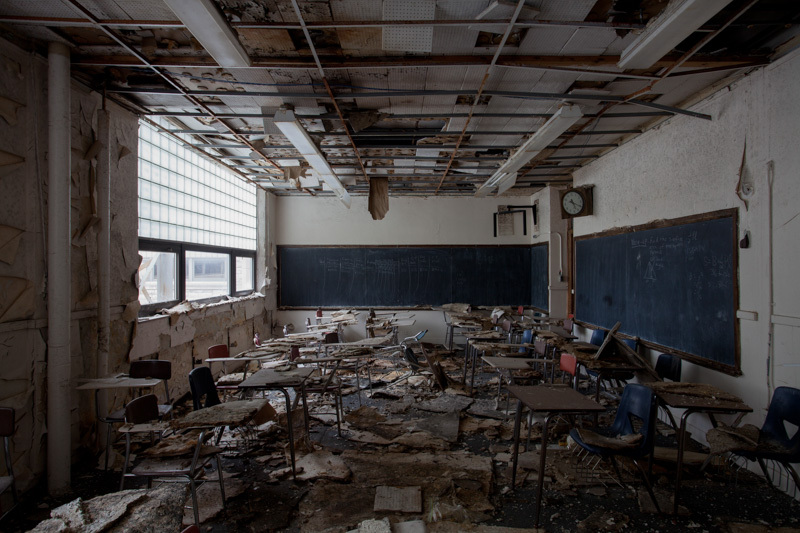 With just 969 students enrolled in 2012, the state of Michigan declared a financial emergency, and the Highland Park City Schools were taken over by a state emergency financial manager, who converted the district into a privately operated charter school system. 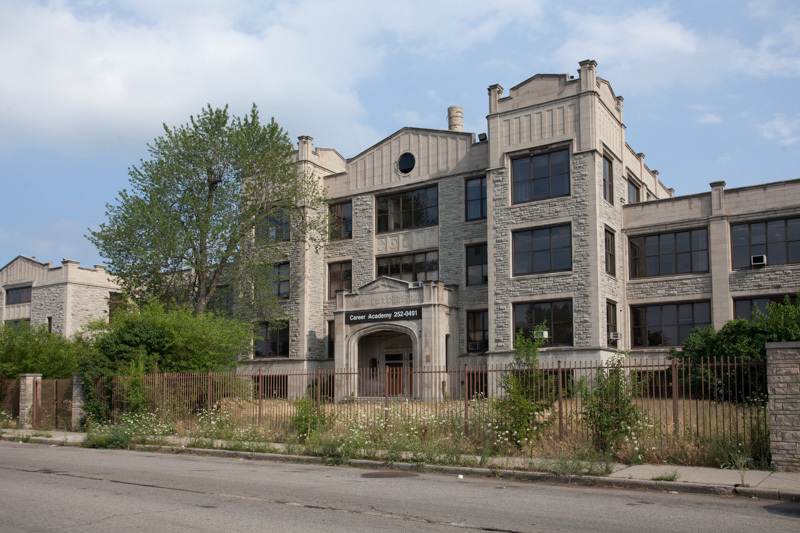 The new charter school operator found that the three remaining school buildings – Highland Park Community High, Ford, and Barber – were in terrible disrepair, and required proximately expensive work to be brought up to standards. 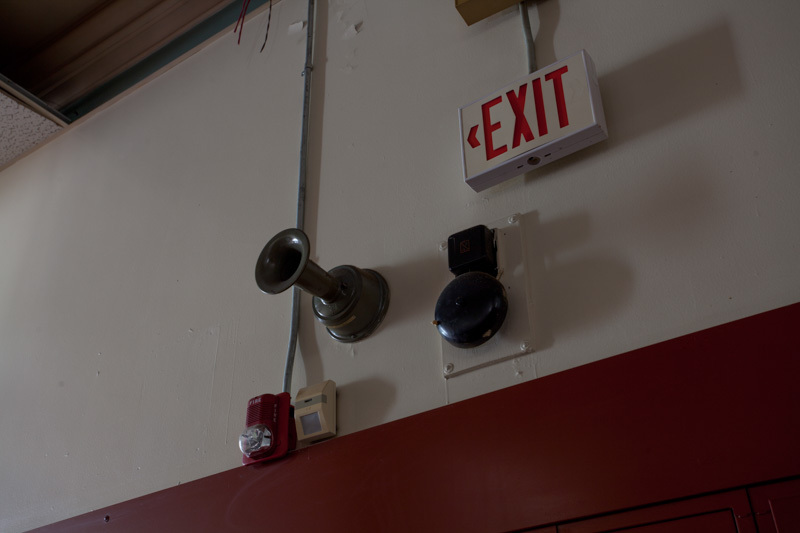 In early 2012, school officials started looking at consolidating all of the schools into one K-12 as a way to save money. 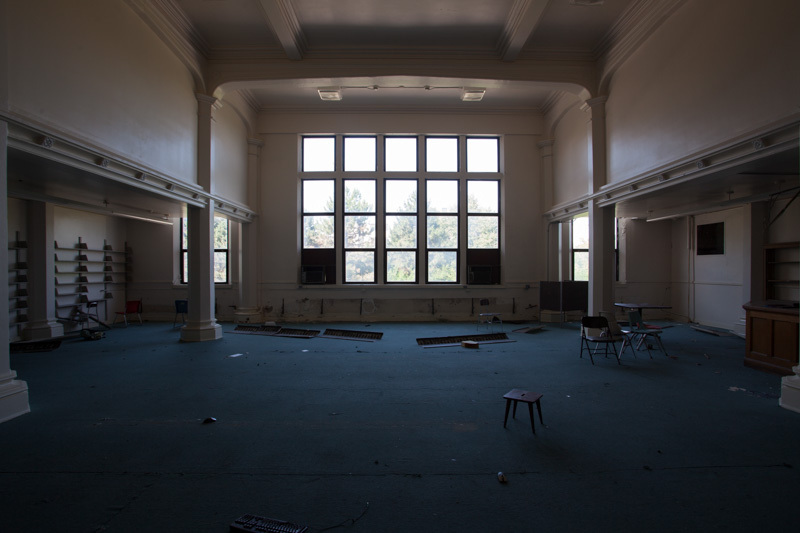 One alternative discussed was the reopening of the old high school and college building, which was large enough to support all of the students left in the district. 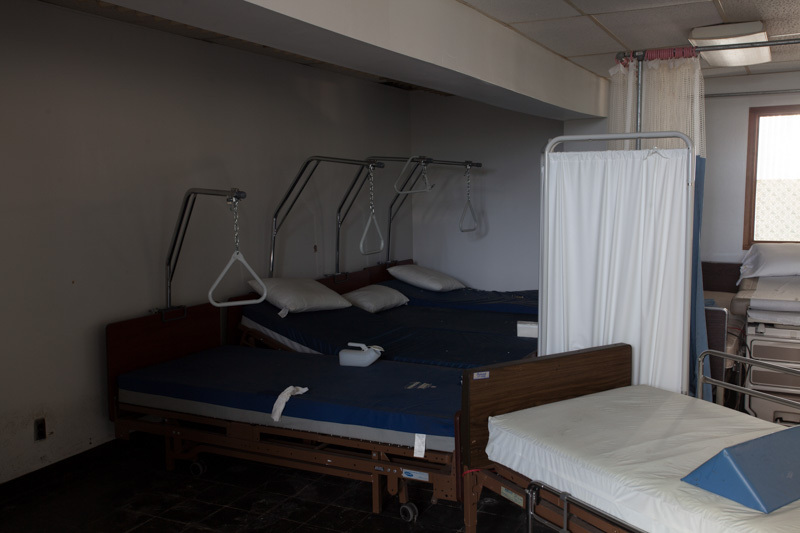 The emergency manager visited the closed building in February to see if it would viable to reopen. 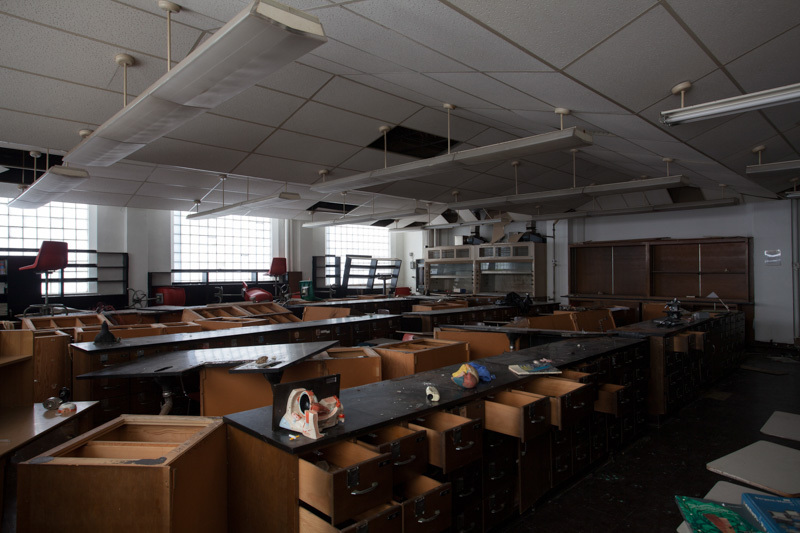 Since its closing in 2009, the old high school and college had been frozen in time, with little more than security and routine maintenance being carried out in its empty halls and classrooms. 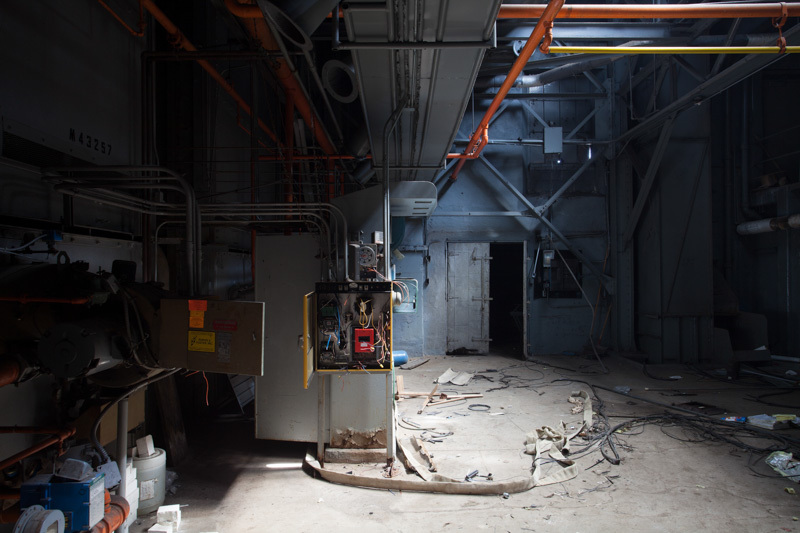 Though fairly secure for a few years, when the state took over the Highland Park City Schools, patrols at the closed building had been discontinued, leaving the school briefly open to scrappers and metal thieves. 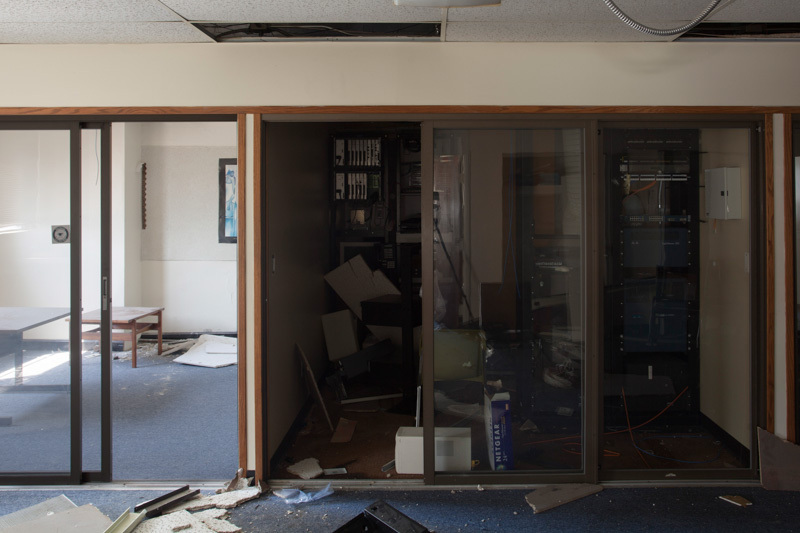 In the short time between the state takeover and the resumption of security at the school, scrappers had done enough damage to make reopening the school cost prohibitive. The plan was abandoned in favor of letting the three remaining schools stay open. 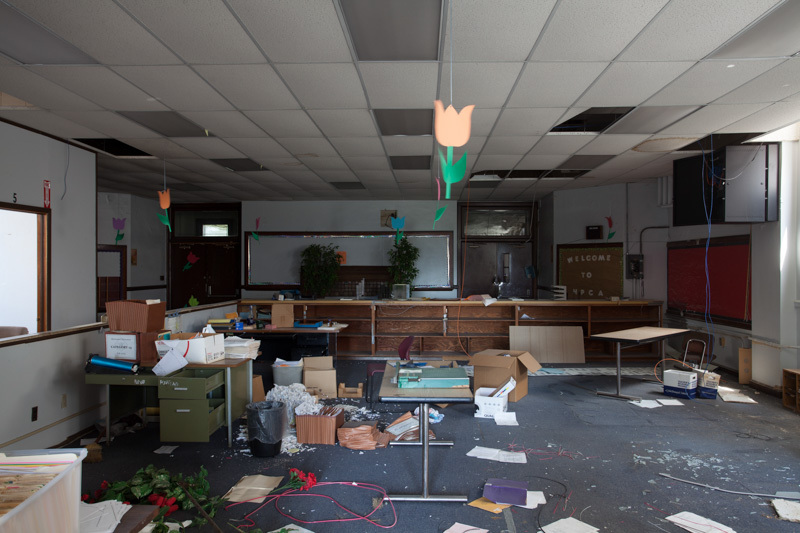 In the years since, scrappers and vandals have dismantled the old Highland Park High School. 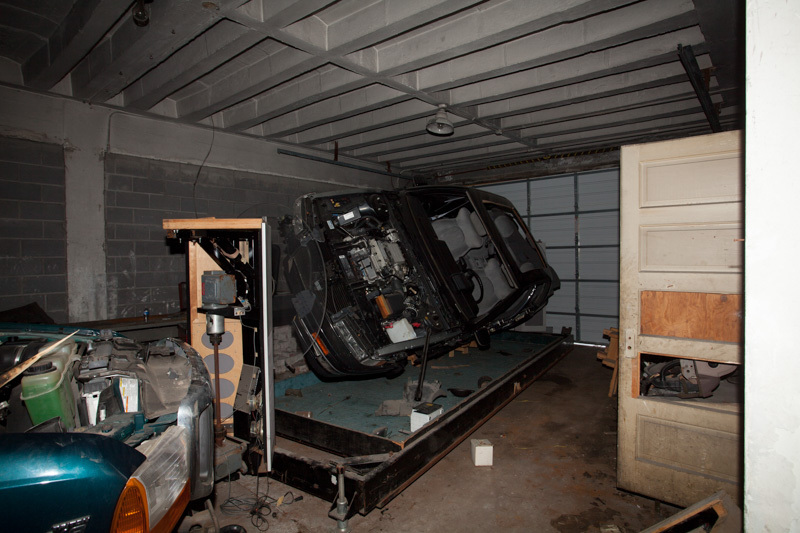 When the local Police department set up two non-working squad cars in the back of the building to deter people from entering, the cars were vandalized and removed less than a month later. 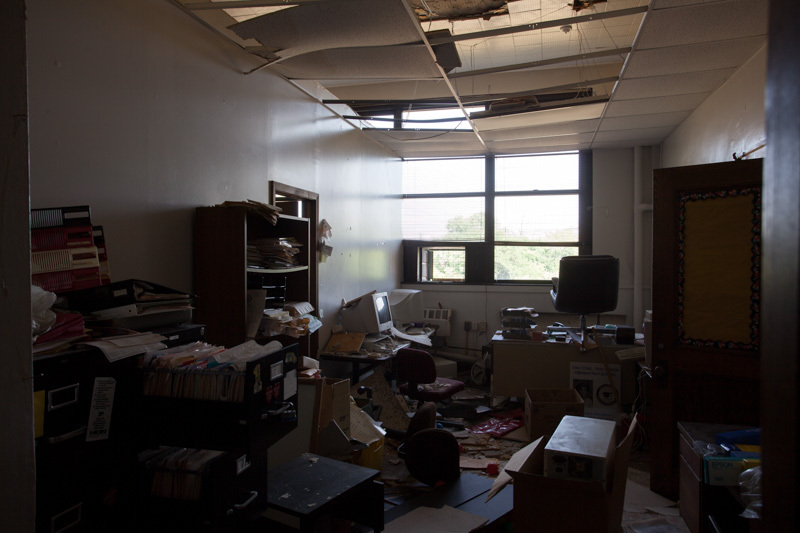 In October of 2012 the windows of the school were boarded up, but by that time the damage had been done. 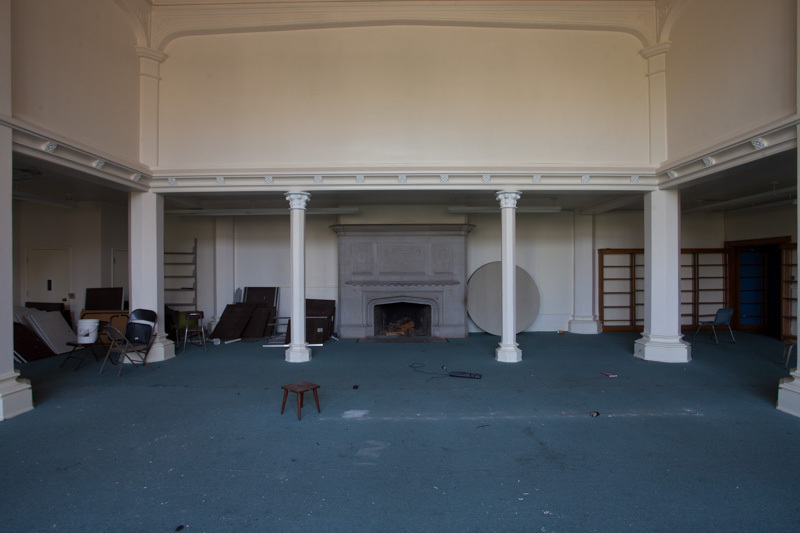 The property was put up for sale with an asking price of $3 million dollars.